Hello, beautiful, chic, Parisian cape. 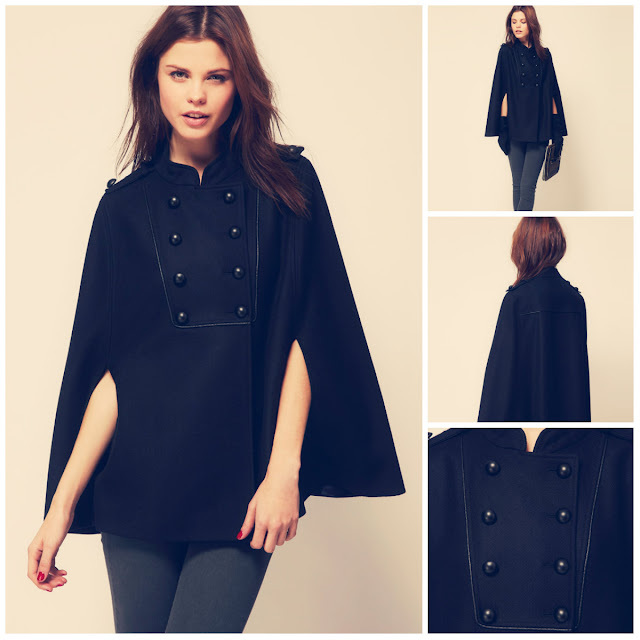 This military cape from Kookai coat would be perfect for cold winter days with a little red beret, don't you think? I've been lusting for a cape for sometime, everyone I've seen wear one seems effortlessly chic and fashionable, it also seems like quite a classic cape that you could wear for seasons to come. To be honest I didn't know Kookai still existed until I came across this cape on ASOS, but I will now definitely be taking a look into their range a little closer. What memories do you have of Kookai? When was the last time you bought something from them? I'd love to know your thoughts in the comment section. I live in Manchester now. I have also been looking for various of cape coats or cape jackets online.. French Connection and Topshop seems to have the older stocks but only available 2nd hand quality on Ebay. I am not sure whether I can place an order with consessions branch so I can have one sooner..